Applications of this research include - psychoacoustics; spatial audio coding; Ambisonics; Wave Field Synthesis; HRTF simplification and binaural rendering; game audio sound design; virtual acoustics; reverberation modeling; acoustic modeling of depth and distance; mono and stereo to multichannel up-mixing; acoustical heritage preservation; interactive audio systems. Dr. Gavin Kearney received an honours degree in electronic engineering from Dublin Institute of Technology, in 2002 and M.Sc. and Ph.D. degrees in audio signal processing from Trinity College Dublin in 2006 and 2010 respectively. He subsequently worked as a Postdoctoral Research Fellow on game audio, while lecturing on the Interactive Digital Systems and Music and Media Technology masters courses at Trinity College Dublin. 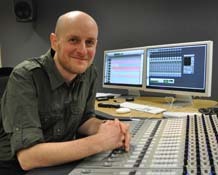 He was appointed Lecturer in sound design at the Department of Theatre, Film, and Television at the University of York in January 2011 where he currently teaches both bachelors and masters level courses on spatial audio and surround sound, audio engineering and sound production and postproduction methods. He also continues to work in the audio industry as a sound engineer and designer. Lecturer in Audio and Music Technology, Department of Electronics, University of York, United Kingdom. External Examiner, The University of the Highlands and Islands, Ness Walk, Inverness. Lecturer in Sound Design, Department of Theatre, Film and Television, University of York, United Kingdom. Instructor for Institute of Acoustics Diploma in Noise Control, Department of Mechanical and Manufacturing Engineering, Trinity College Dublin, Dublin 2, Ireland. Part-time Lecturer in MSc. in Interactive Digital Systems, Department of Computer Science, Trinity College Dublin, Dublin 2, Ireland. Research Fellow, Game-audio and auralisation research on the Science Foundation Ireland Metropolis Project, Department of Mechanical and Manufacturing Engineering, Trinity College Dublin, Dublin 2, Ireland. Part-time Lecturer in M.Phil in Music and Media Technologies, Department of Electronics, Trinity College Dublin, Dublin 2, Ireland. Part-time Lecturer in Audio Visual Media Systems Technology Institute of Art, Design and Technology (IADT), Kill Avenue, Dun Laoghaire, Co. Dublin, Ireland. Research Assistant, Network and Telecommunications Research Group, Trinity College Dublin, Dublin 2, Ireland.